Remember that for your quince cake it should always reflect something about you. Think about what kind of girl you are! What are your favorite colors and designs? Get some inspiration from these fabulous 2016 cake trends that we are presenting to you. Consider which of these elements you would like to incorporate into your cake to make one that is original and perfect for you. This type of cake is known for giving an elegant feel to viewers. Standard cakes usually have two layers and can be as tall as six inches. As for tall cakes, it’s basically a cake with an extended height. 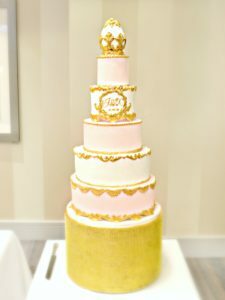 In addition to its multi-layer look, we also recommend this cake for girls planning a big quince with over 100 guests. Most tall cakes are also six inches tall in length and have at least three layers. 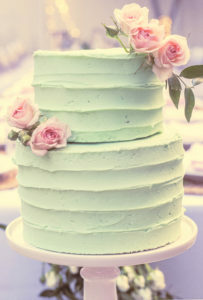 However, it is important to remember that since tall cakes have more layers, it will also need more support for the base so that the top layer doesn’t collapse onto the bottom layer! You can always use plastic dowels and a cake board. So go ahead, impress them with this over-the-top quince cake! Here’s a little background information on baroque: this artistic style was first created around 1600 and became popular in Rome, Italy, and Europe. This was a type of architecture that used great and clear details depicting an intricate and detailed design. 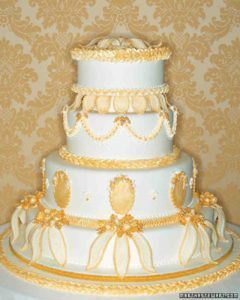 Similarly, this type of cake often has a gold-colored layer and gives an elegant and artistic feel. Feel free to get creative and come up with your own baroque design. Keep in mind that your cake should complement you, so make sure the design of the cake matches your theme and the overall feel of your Quinceañera. In addition to the elaborate design, add a monogram to make it look even more personalized. If you are a lover of art and want a unique cake, this type might just be the best for you! Illustrated cakes can be both a pleasure in sight and taste. Some girls might use floral or large graphics, while others may choose scripted prints. 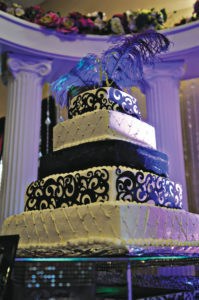 You can always choose what you like to paint on the cake and make it the centerpiece at your Quince celebration! 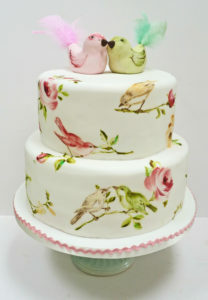 In case you haven’t noticed, nature is a very popular theme in painted cakes. Most girls ask for a garden theme or simply a decoration of flowers and trees. If you want more complexity other than flowers, anything else that relates to nature, such as birdies and butterflies are a good option. Remember you can always get creative with the cake you want. The texture of your cake can make its appearance more eye-catching. Here are some that we recommend: horizontal and vertical stripes, combed buttercream, and rustic buttercream. Unlike fondant cakes, this cake is made from creaming butter with powdered sugar. You can always add a flowy or ruffle design. To make it even better, consider which colors you would like and add different colors or even make it an ombré cake. Furthermore, it might help if you also think about what shapes you would like to include. Adding shapes and texture to your cake will definitely improve its appearance by making it look more magnificent and impressive! This type of cake is highly suggested for those of you wishing to catch the eyes of your guests with a simple and contemporary design. These cakes can come with patterns such as squares and stripes. Stay simple with the colors because you don’t want to overwhelm the viewers with detailed design and fancy colors. Since this cake is more focused on the design, just choose two of your most favorite colors and go with it! This cake may not have buttercream ruffles or a flowy design, but it can be decorated with cute little designs, such as hearts, real fruits and flowers. These can also be used to match the theme of your quince. 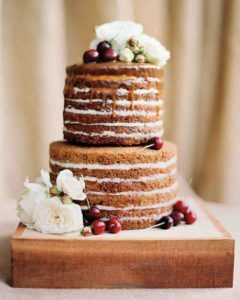 Naked cakes have won the hearts of many quince girls because of its amazing appearance through simplicity. You can decorate it even more by adding berries such as strawberries, raspberries and blueberries. Similar to geometric cakes, you can have a square naked cake with smooth edges and matching colors. These cakes are also popular for being traditional and simple. It can also be very romantic since it can be decorated with real roses. If that is what you want others to see, make sure you have a naked cake at your quince! Despite its differences in designs, colors and flavors, the most important part of it all is for you and your family to have a memorable time together. There are so many other types of cake out there. Whether you choose a tall one, or a baroque or a naked cake, just remember that this celebration can be one of your most special moments in life. A cake will definitely help in making a sweet memory for you and your family! What is your favorite Quince cake trend?